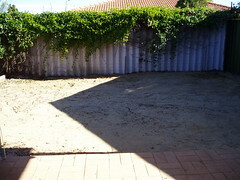 This is the same area of ground looking towards the back fence. Fortunately the studio has got to be 900cm from both the back and side fences so the lovely Orange Trumpet Vine creeper from the garden at the back can stay. My husband is going to brick pave the 900cm areas around the studio so that it can be kept clear of junk.....what's to bet that junk will appear in the newly created 'storage area' very quickly??? The studio will run five metres along the back fence and come forward 4 metres to meet up with the brick paving in the foreground.